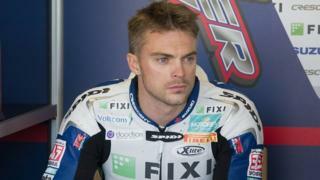 Kent rider Leon Camier tells BBC Radio Kent he is frustrated he has not secured a new deal at Suzuki despite the fact he felt an agreement had been reached with the team. The 27-year-old has not been re-signed for the 2014 World Superbike Championship, with Eugene Laverty and Alex Lowes contracted instead. Camier says he shook hands on an agreement with team principle Paul Denning but Denning believes Camier has a "wayward interpretation" of negotiations and his perspective "doesn't mirror the facts".